Your diaphragm is a muscle above your stomach, and your esophagus passes through an opening (hiatus) in your diaphragm to connect to your stomach. A hiatal hernia is when part of your stomach pushes up through the opening. It can be caused by excess pressure, such as lifting heavy objects or coughing/vomiting. If only a small portion of your stomach pokes through, you may not even know you have a hiatal hernia. 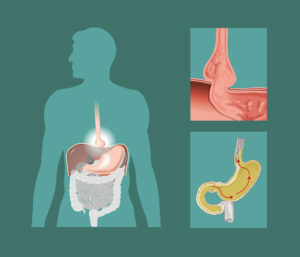 However, a large hiatal hernia can allow food and/or acid to back up into your esophagus, causing heartburn.